Karen Uhlenbeck made history being the first woman recipient of the Abel Prize. She received the award for "her pioneering achievements in geometric partial differential equations, gauge theory and integrable systems, and for the fundamental impact of her work on analysis, geometry and mathematical physics [which have] "led to some of the most dramatic advances in mathematics in the last 40 years." The news was covered in media worldwide, and was apt this Women's History Month. Read Tony Phillips' Take and Media Coverage of Math here. "Collective memory is acknowledged to be a combination of two distinct processes: communicative memory, normally sustained by the oral transmission of information, and cultural memory, which is sustained by the physical recording of information." This observation is the basis for the discovery that "the attention received by cultural products decays following a universal biexponential function." The work is reported in "The universal decay of collective memory and attention" (Nature Human Behaviour 3, 82-91, January, 2019). 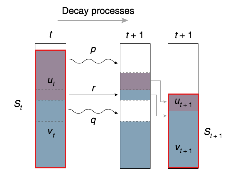 The authors, a team of five led by Cristan Candia and César Hildago (MIT) "use data on the citation of academic articles and patents, and on the online attention received by songs, movies and biographies, to describe the temporal decay of the attention received by cultural products." The authors make some initial simplifying assumptions. "First, we assume that the current attention, $S(t)$, of a cultural product is the sum of the attention it garners from both communicative memory $u$ and cultural memory $v$. Hence, at any given time $S(t)=u(t)+v(t)$. Second, we assume that communicative and cultural memory decay, in relative terms, independently with decay rates $p+r$ for communicative memory and $q$ for cultural memory, and that information flows from communicative memory to cultural memory at a rate $r$. " The basic mechanics of the model: "at any time point $t$, the total memory is the sum of communicative memory $u$ and cultural memory $v$. Both communicative and cultural memory decay with their own respective decay rates $p+r$ and $q$, and cultural memory grows with $r$." The red curve is the "current attention" $S(t)$ paid to a typical cultural product plotted (logarithmically!) against time. It is the sum of the purple curve (communicative memory, decays much faster) and the blue curve (cultural memory), hence a "biexponential." (The coefficients $p,q,r$ depend on the cultural product considered). Image from Nature Human Behaviour 3, 82-91, used with permission. The authors tested their model against various real-world "cultural products," e.g. American Physical Society papers (metric: citations received in the past six months), popular music (Spotify popularity and Last.fm play counts) and biographies of "highly performing athletes in tennis, basketball and the Olympics" (Wikipedia page views); they found that their model was "statistically better at explaining the empirically observed decay of attention than the [...] functions used in the previous literature." 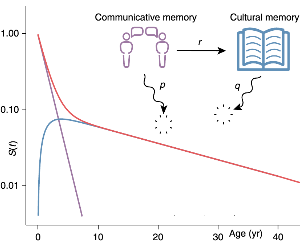 They add: "More importantly, in several of these empirical curves, the shoulder of the biexponential curve is clearly visible, allowing the model to help to unveil the point at which cultural memory takes over communicative memory." The Washington Post's Morning Mix (February 26, 2019) spread the news: "Hello, hive mind: Bees can do basic arithmetic, a new study finds." Isaac Stanley-Becker starts: "The oval-shaped brain of a honeybee is roughly the size of a single sesame seed. It contains fewer than 1 million neurons, while the human brain contains 100 billion. A team of entomologists is asking what all those extra nerve cells are good for after finding that bees can do the kind of fundamental mathematics once thought to distinguish humans and the primate animals they most closely resemble." Quite a few animals can count but bees, as reported in Science Advances, are good at addition and subtraction, too. Researchers at the Royal Melbourne Institute of Technology trained 14 bees to associate blue with addition ($+1$) and yellow with subtraction ($-1$). After some 100 trials, they were tested: At the entrance to a Y-maze was an image of $k$ (2 to 5) shapes (circles, squares, triangles or diamonds) in either yellow or blue on a black background. Inside the "decision chamber" they had to choose between two images of that color: in the blue mode, one had $k+1$ of the same shapes; in the yellow mode, one had $k-1$ of them; in either case the other had a different number, same shape, same color. A sample addition trial: the image on the outside of the maze shows 2 blue squares. Inside, the bee has to choose between 3 squares (correct) and 1 square (incorrect). Images from an open source article in Science Advances Vol. 5, no. 2, eaav0961. A sample subtraction trial: the image on the outside of the maze shows 3 yellow squares. Inside, the bee has to choose between 3 squares (incorrect) and 2 squares (correct). Stanley-Becker: "Each bee performed four tests, each consisting of 10 trips through the maze. In each test, conducted without punishments or rewards, the bees performed significantly better than chance. [...] The discovery casts doubt on the idea that numerical understanding is innate to humans, who are separated from honeybees by more than 400 million years of evolution, as the paper notes. The result suggests instead that bees, nonhuman animals and pre-verbal people may each be 'biologically tuned for complex numerical tasks,' a capacity honed through the struggle for survival in 'complex environments that have forced them to use numbers and quantify.'" The interior quotes are from Scarlett Howard, the lead author and a postdoctoral fellow at the CNRS, who added: "We're not the only sophisticated ones." On March 19, 2019 the Norwegian Academy of Science and Letters announced that the Abel Prize for 2019 was awarded to to "Karen Keskulla Uhlenbeck of the University of Texas at Austin, USA" for "her pioneering achievements in geometric partial differential equations, gauge theory and integrable systems, and for the fundamental impact of her work on analysis, geometry and mathematical physics." The Abel Prize is always a big deal; Uhlenbeck's being the first woman so honored made it especially newsworthy. Although some papers, like the Washington Post and The Guardian, just relayed the feed from the Associated Press, others went the extra mile. "Karen Uhlenbeck, première femme lauréate du prix Abel de mathématiques" was David Larousserie's story in Le Monde. Larousserie sketches her professional history, noting that she was Richard Palais' student [at Brandeis] with a thesis in analysis and partial differential equations. He also mentions that she co-founded the Program for Women and Mathematics at the Institute for Advanced Study. "Her contributions to mathematics extend well beyond her field, since her work describing the behavior of equations on various surfaces has been used in physics to describe the world of particles or to work out quantum theories of gravitation." Roussarie quotes a statement from Robbert Dijkgraaf, the director of the IAS, stating that she has "played a major role in the progress of mathematics and has inspired following generations of women to become leaders in the field." "American Is First Woman to Win Prestigious Abel Prize for Mathematics" was the headline for Kenneth Chang's coverage in the New York Times. Chang focuses on Uhlenbeck's work on minimal surfaces. "In her early work, Dr. Uhlenbeck essentially figured out the shape of soap films in higher-dimensional curved spaces. This is an example of what mathematicians call optimization problems, which are often very difficult and can have zero solutions, one solution or many solutions. 'You can ask a question of when you have a soap bubble in this n-dimensional space,' she said. 'You don't know ahead of time what the shapes of those minimal soap bubbles are going to be.' [...] Dr. Uhlenbeck showed that the problem was not unsolvable everywhere, although at a finite number of points, the calculations would not converge. Thus, one could get a handle on the answer by handling those troublesome points separately. [...]" "Dr. Uhlenbeck said she recognized that she was a role model for women who followed her in mathematics. 'Looking back now I realize that I was very lucky,' she said. 'I was in the forefront of a generation of women who actually could get real jobs in academia.' But she also noted: 'I certainly very much felt I was a woman throughout my career. That is, I never felt like one of the guys.' To find an influential woman, she looked to television. 'Like many people in my generation,' Dr. Uhlenbeck said, 'my role model was Julia Child.'" The New Yorker's Isaac Chotiner interviewed Karen Uhlenbeck over the phone for a posting: "A ground-breaking mathematician on the gender politics of her field" in their "Q and A" series (March 28, 2019). Not just politics: the interview covers her own career, women in mathematics and mathematics itself. E.g. "And I do have to say that, in being a mathematician, I'm lucky. I was a very good student, and I was a good mathematician. It took me a long time to realize it. And when I went one-on-one with people and talked to them, they recognized this and they accepted it and they accepted me."